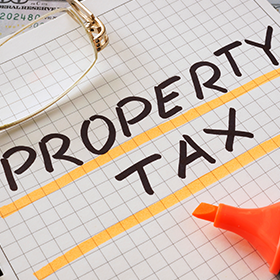 These dates vary, most counties will begin accepting payments in October and have a delinquent date of December 10th or 12th for the first half of property taxes (interest begins accruing after this date). For these counties the second installment is delinquent after April 10th. These dates do vary, especially for the smaller counties. If the client is unsure of the due date and does not have an automatic payment, they should either check the county’s website online or contact the county's office directly. 2. What should IRA holders do to make sure that the property taxes get paid? The client should first determine where their bill is mailed (this is especially important for new asset purchases, often counties do not update the mailing address for property taxes until the next year). If they have a recurring payment setup at The Entrust Group, our office simply requires the tax bill. If they receive the bill at their residence it should be forwarded to our office. If the client does not have an automatic payment with us they should send a Payment Authorization Letter along with their tax bill to either our forms' e-mail address or mail them directly to our office. They should also be sure to check their e-mail inbox for any bills that may be sent to them to be read and approved (perhaps a good time for certain clients to update the e-mail on file). As a final check they should contact the county the first week of December (or a few weeks before the delinquent date for counties with differing due dates) to determine if their property tax has been paid. This will give them time to fund their account and have the payment sent out before penalties are assessed. There are times that clients will submit a Payment Authorization Letter for property taxes that will have non sufficient funds. They should double check their account balance on the Entrust client portal before submitting their property tax payment request to ensure quick processing. 3. What IRA holders can do to make property tax payments an automatic process? One important thing to know about property taxes is that many counties will only send property tax bills once a year. There have been situations where new asset owners will not set up their property tax payment as automatic, and when they pay the first half of their taxes in December, they are eventually being penalized for the second half which is due within the next half year. The client can select the “recurring” option on their Payment Authorization Letter along with the frequency “annual or other: semi annual”. If they would like to continue property tax payments until their asset is eventually sold they can leave the end date blank. As long as the property tax bill arrives at our office the payment will be processed, provided there are enough funds in the account. For more information about Real Estate IRAs and how they work, please visit our Real Estate IRA Center or talk with an Entrust professional. Sign up for a free consultation today.